ALVA, Okla. – Maverick Harper readily admits that his rodeo legacy has helped him in the arena. 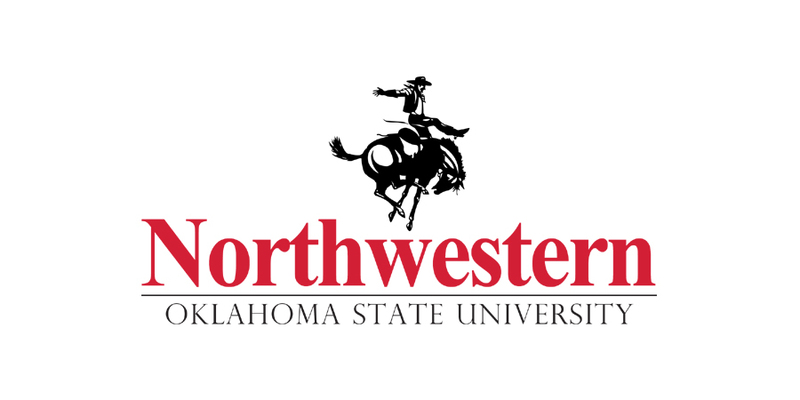 The Northwestern Oklahoma State University cowboy proved it this past weekend by winning the heading and all-around titles at the Southwestern Oklahoma State University rodeo in Weatherford. He also finished second in tie-down roping and placed in steer wrestling. “My parents have been the biggest help of my life,” said Harper, a senior from Stephenville, Texas. “They’ve supplied me with what I need. His mother, Debra, is a Wrangler National Finals Rodeo qualifier in barrel racing, while step-father, Gary Green, is a seven-time NFR qualifier in steer wrestling. His grandfather, James Morgan, also qualified in tie-down roping and was the co-owner of Harper & Morgan Rodeo Co.
“It was set up for me to rodeo the rest of my life,” Maverick Harper said. He’s taking advantage of it at the college level. In Weatherford, he and partner Tanner Nall of Colcord, Okla., won the first round with a 6.5-second run. Their 7.2 in the final round was good enough for second, and their two-run cumulative time of 13.7 earned the tandem the victory. Harper roped and tied his first-round calf in 9.2 seconds to finish fourth, then put together a 10.0 to finish second in the short round and average. He placed in a tie for fifth in the first round of steer wrestling with a 4.7-second run and ended up tied for sixth overall. The Weatherford rodeo marked the return to outdoor arenas. The Central Plains Region features four outdoor rodeos in the fall, followed by three indoor events to kick off the spring semester. The final three rodeos – Southwestern, Fort Hays (Kan.) State University and Oklahoma Panhandle State University – are all larger, outdoor pens. Northwestern finished second in the men’s team race, helped by gathering key points in all three men’s timed events. In addition to Harper, six other Rangers picked up points. Heeler Sage Lamunyon of Enid, Okla., placed in the long round with his partner, Southwestern’s Layton Little. Steer wrestler Talon Roseland of Marshalltown, Iowa, led all bulldoggers by finishing second overall, while Bridger Anderson of Carrington, N.D., placed third. Cody Devers of Perryton, Texas, won the first round and finished fourth overall. In tie-down roping, Colton Brown of Nocona, Texas, was the highest finisher, earning third place in the short round and fourth overall. Cole Patterson of Pratt, Kan., placed in both rounds and finished fifth. The Northwestern women finished fifth in Weatherford, led by barrel racer Sara Bynum of Beggs, Okla., who placed in both rounds and finished fourth in the average. Aundrea Dufrane placed in both rounds of goat-tying and finished fifth overall, while Melissa Couture of Springdale, Ark., stopped the clock in 8.2 seconds to finish sixth in the short round. Both the Northwestern men’s and women’s team sit second in the region standings heading into the final two rodeos of the season. It’s vital to stay at the top of the game; only the top two teams and top three individuals in each event advance to the College National Finals Rodeo, set for June 10-16 in Casper, Wyo. And his decision to compete in rodeo at Northwestern stands as one of the top decisions he has made in his young career.